Sill today Bangladesh belongs to 1.5 core farmers families and they all reside in villages. Adult males of these families do not have any specific task at late afternoon, so, they gather and pass couple of hours at tea stalls of villages’ market and discuss or gossip among themselves with limitless non-productive issues. Our chairman Saleh Mazed has observed that this thing has been happening years after years. To break the impasse, he pioneered an epoch-making concept of Teaschool that the male villagers can be learned and motivated at tea stall at their gossip-time. The design of Teaschool is very simple. We select a tea stall in a village market and named it Point, subsequently owner of the tea stall is appointed as Point Manager. But the cardinal role is played by the Point Leader who is known as secular, non-political, pragmatic and widely acceptable to the villagers. He leads the team of participants as well as (is) the main speaker to the session. Point leaders are given certain topics as designed be the Central office to discuss with. We have a panel of expert motivators who make the topics and learning materials. Topics are created aiming to change in rural peoples’ thought process, for instance, raving the superstitions, irrational, illogical beliefs/ traditions related to practices during pregnancy period, giving birth to girl-baby versus boy-baby, necessity of women education, bad effects of child marriage, antidrug campaign, earning women versus house wives, women empowerment, food habit versus illness, cleanness versus disease, sanitation versus unhappiness, modern and scientific treatment versus TANTRA, modern education versus religious education, saving versus poorness, attitudes towards physically and mentally challenged children, fundamentalism versus secularism and traditional thinking versus modern and scientific thinking method. Besides, first steps to emergency health issues and natural disaster also be discussed here. Participants are given a cup of tea along with two pieces biscuits by courtesy of Faiz Foundation during every single session of forty minutes. Moreover Faiz Foundation provides a newspaper daily at each point and also encourages the Point managers paying tuitions fees of their school going children. 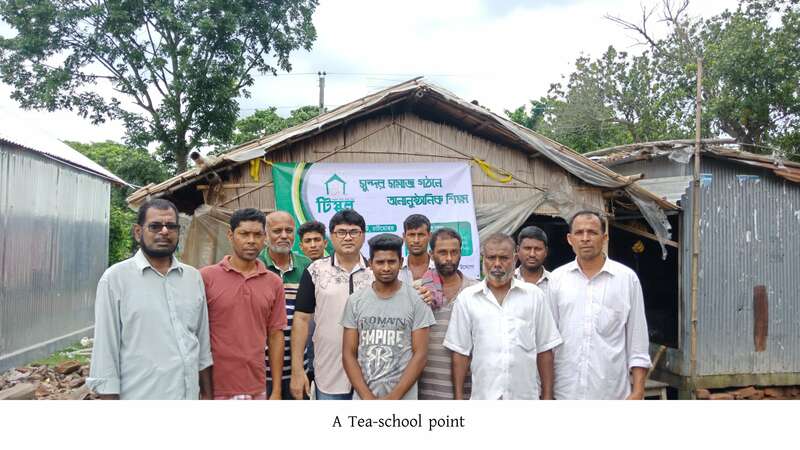 We have started our activities in 10 villages of Pabna district, Bangladesh but we believe that this unique concept will sprout soon beyond geographical boundary of Bangladesh since all underdeveloped and developing countries need to run this type of activities undoubtedly.